غول سرخ یک ستاره بزرگ و درخشان است که در مرحله دوم عمرش به سر می‌برد همجوشی هسته‌ای در لایه بیرونی مرکز این ستاره اتفاق می‌افتد. هسته این ستارگان بسیار فشرده از جنس هلیوم است و دمای سطح آن‌ها کمتر از ستارگانی که مرحله اول عمرشان را می‌گذرانند می‌باشد (حدود ۵۰۰۰ درجه سانتی‌گراد). یک ستاره بعد از چند میلیارد سال برای واکنش‌های همجوشی هسته‌ای هیدروژن کافی در هسته اش ندارد. در عوض هلیوم‌های باقی‌مانده از واکنش‌های قبلی در هسته ستاره مانده، در لایه‌های بیرونی ستاره هنوز مقداری هیدروژن موجود است ولی به مقدار کافی گرم نیستند تا در واکنش هسته‌ای شرکت کنند. بنابراین به دلیل عدم سوخت ستاره شروع به سرد شدن و کوچک شدن می‌کند لایه‌های درونی ستاره بر اثر جاذبه به سمت هسته کشیده می‌شوند و همین‌طور گرم تر می‌شوند بخش بیرونی ستاره به قدر کافی گرم می‌شوند تا فرایند همجوشی هسته‌ای را شروع کند ستاره منبع انرژی جدیدی می‌یابد سپس پوسته ستاره شروع به سوختن می‌کند و گرمای تولید شده باعث منبسط شدن ستاره می‌شود که غول سرخ نامیده می‌شود. در ۵ الی ۶ میلیارد سال آینده، خورشید تمام سوخت هیدروژن موجود در هسته خود را مصرف می‌کند و شروع به منبسط شدن می‌کند. در بزرگترین حالت، سطح آن به حدود مدار فعلی زمین خواهد رسید. سپس خورشید اتمسفر خود را به‌طور کامل از دست می‌دهد؛ لایه‌های بیرونی یک سحابی سیاره‌ای و هسته یک کوتوله سفید را تشکیل می‌دهد. تکامل خورشید در مرحله غول سرخ به‌طور کامل مدل‌سازی شده است، اما هنوز مشخص نیست که آیا خورشید زمین را خواهد بلعید یا اینکه زمین در مدار خود باقی خواهد ماند. عدم اطمینان در این مورد به این دلیل است که خورشید درحالی که هیدروژن را می‌سوزاند، جرم خود را به تدریج از دست می‌دهد و در نتیجه گرانش آن نیز کمتر شده و باعث می‌شود در طی چند میلیارد سال آینده مدار زمین (و بقیه سیارات منظومه شمسی) به مدار دورتری منتقل شود و زمین از خورشید فاصله بیشتری بگیرد. همچنین عدم قطعیتی در مورد محاسبه مدار سیارات در ۵ الی ۶ میلیارد سال آینده وجود دارد، بنابراین سرنوشت زمین به خوبی مشخص نیست. در درخشانترین حالت، خورشید غول سرخ چند هزار بار درخشان تر از امروز خواهد بود اما دمای سطح آن حدود نیمی از دمای فعلی خواهد بود. در فاز غول سرخ، خورشید به قدری درخشنده خواهد شد که تمام آب موجود روی زمین را به درون فضا تبخیر می‌کند و زمین دیگر قادر به پشتیبانی از حیات نخواهد بود. خورشید در 4 میلیارد سال بعدی، به نور افشانی ادامه خواهد داد و اندازه ی آن به تدریج بزرگ خواهد شد، به طوری که قطر آن 25 درصد بزرگتر از مقدار فعلی می شود، اما دمای آن تقریبا معادل دمای فعلی باقی می ماند و درخشندگی آن تا 50 درصد بیشتر می شود . تمام هیدروژن موجود د رخورشید به هلیوم تبدیل شده و آنچه در مرکزخورشید باقی می ماند، یک مغز هلیومی، یعنی یک منطقه ی کوچک چگال است که تقریبا به طور کامل محتوی هلیوم است. میلیاردها سال پس از این مرحله، یعنی هنگامی که سن خورشید به 10 میلیارد سال می رسد، خورشید دو و نیم بار بزرگتر از اندازه ی کنونی می شود، در طی این افزایش اندازه، دما کاهش می یابد زیرا منبع جدید دیگر برای تولید انرژی در کار نیست، محاسبه شده، مغز هلیومی خورشید در این مرحله حدود 40 هزار کیلومتر قطر دارد که تنها یک صدم اندازه ی خورشید در آن زمان است، سپس انقباض مغز هلیومی آغاز می شود تا جایی که قطرش حدود دو برابر قطر زمین می شود و یک چهارم کل جرم خورشید را در بر می گیرد. نکته ی جالب توجه این است که در این حالت، مغز هلیومی یک میلیون بار پر جرم تر از زمین می شود و چگالی گاز در این مغزی، 50 هزار برابر چگالی آهن می شود، یعنی وزن یک انگشتانه پر از ماده ی ان به حدود یک تن می رسد. ↑ پاول هاچ. ساختار ستارگان و کهکشان ها. ترجمه توسط توفیق حیدرزاده. گیتاشناسی. 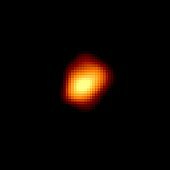 For other uses, see Red giant (disambiguation). A red giant is a luminous giant star of low or intermediate mass (roughly 0.3–8 solar masses (M☉)) in a late phase of stellar evolution. The outer atmosphere is inflated and tenuous, making the radius large and the surface temperature around 5,000 K (4,700 °C; 8,500 °F) or lower. The appearance of the red giant is from yellow-orange to red, including the spectral types K and M, but also class S stars and most carbon stars. Red giants are stars that have exhausted the supply of hydrogen in their cores and have begun thermonuclear fusion of hydrogen in a shell surrounding the core. They have radii tens to hundreds of times larger than that of the Sun. However, their outer envelope is lower in temperature, giving them a reddish-orange hue. Despite the lower energy density of their envelope, red giants are many times more luminous than the Sun because of their great size. Red-giant-branch stars have luminosities up to nearly three thousand times that of the Sun (L☉), spectral types of K or M, have surface temperatures of 3,000–4,000 K, and radii up to about 200 times the Sun (R☉). Stars on the horizontal branch are hotter, with only a small range of luminosities around 75 L☉. Asymptotic-giant-branch stars range from similar luminosities as the brighter stars of the red giant branch, up to several times more luminous at the end of the thermal pulsing phase. Among the asymptotic-giant-branch stars belong the carbon stars of type C-N and late C-R, produced when carbon and other elements are convected to the surface in what is called a dredge-up. The first dredge-up occurs during hydrogen shell burning on the red-giant branch, but does not produce a large carbon abundance at the surface. The second, and sometimes third, dredge up occurs during helium shell burning on the asymptotic-giant branch and convects carbon to the surface in sufficiently massive stars. The stellar limb of a red giant is not sharply defined, contrary to their depiction in many illustrations. Rather, due to the very low mass density of the envelope, such stars lack a well-defined photosphere, and the body of the star gradually transitions into a 'corona'. The coolest red giants have complex spectra, with molecular lines, emission features, and sometimes masers, particularly from thermally pulsing AGB stars. Another noteworthy feature of red giants is that, unlike Sun-like stars whose photospheres have a large number of small convection cells (solar granules), red-giant photospheres, as well as those of red supergiants, have just a few large cells, the features of which cause the variations of brightness so common on both types of stars. This image tracks the life of a Sun-like star, from its birth on the left side of the frame to its evolution into a red giant on the right after billions of years. Red giants are evolved from main-sequence stars with masses in the range from about 0.3 M☉ to around 8 M☉. When a star initially forms from a collapsing molecular cloud in the interstellar medium, it contains primarily hydrogen and helium, with trace amounts of "metals" (in stellar structure, this simply refers to any element that is not hydrogen or helium i.e. atomic number greater than 2). These elements are all uniformly mixed throughout the star. The star reaches the main sequence when the core reaches a temperature high enough to begin fusing hydrogen (a few million kelvin) and establishes hydrostatic equilibrium. Over its main sequence life, the star slowly converts the hydrogen in the core into helium; its main-sequence life ends when nearly all the hydrogen in the core has been fused. For the Sun, the main-sequence lifetime is approximately 10 billion years. More-massive stars burn disproportionately faster and so have a shorter lifetime than less massive stars. When the star exhausts the hydrogen fuel in its core, nuclear reactions can no longer continue and so the core begins to contract due to its own gravity. This brings additional hydrogen into a zone where the temperature and pressure are adequate to cause fusion to resume in a shell around the core. The outer layers of the star then expand greatly, thus beginning the red-giant phase of the star's life. As the star expands, the energy produced in the burning shell of the star is spread over a much larger surface area, resulting in a lower surface temperature and a shift in the star's visible light output towards the red—hence it becomes a red giant. At this time, the star is said to be ascending the red-giant branch of the Hertzsprung–Russell (H–R) diagram. Mira A is an old star, already shedding its outer layers into space. The evolutionary path the star takes as it moves along the red-giant branch, which ends with the complete collapse of the core, depends on the mass of the star. For the Sun and stars of less than about 2 M☉ the core will become dense enough that electron degeneracy pressure will prevent it from collapsing further. Once the core is degenerate, it will continue to heat until it reaches a temperature of roughly 108 K, hot enough to begin fusing helium to carbon via the triple-alpha process. Once the degenerate core reaches this temperature, the entire core will begin helium fusion nearly simultaneously in a so-called helium flash. In more-massive stars, the collapsing core will reach 108 K before it is dense enough to be degenerate, so helium fusion will begin much more smoothly, and produce no helium flash. The core helium fusing phase of a star's life is called the horizontal branch in metal-poor stars, so named because these stars lie on a nearly horizontal line in the H–R diagram of many star clusters. Metal-rich helium-fusing stars instead lie on the so-called red clump in the H–R diagram. An analogous process occurs when the central helium is exhausted and the star collapses once again, causing helium in a shell to begin fusing. At the same time hydrogen may begin fusion in a shell just outside the burning helium shell. This puts the star onto the asymptotic giant branch, a second red-giant phase. The helium fusion results in the build up of a carbon–oxygen core. A star below about 8 M☉ will never start fusion in its degenerate carbon–oxygen core. Instead, at the end of the asymptotic-giant-branch phase the star will eject its outer layers, forming a planetary nebula with the core of the star exposed, ultimately becoming a white dwarf. The ejection of the outer mass and the creation of a planetary nebula finally ends the red-giant phase of the star's evolution. The red-giant phase typically lasts only around a billion years in total for a solar mass star, almost all of which is spent on the red-giant branch. The horizontal-branch and asymptotic-giant-branch phases proceed tens of times faster. If the star has about 0.2 to 0.5 M☉, it is massive enough to become a red giant but does not have enough mass to initiate the fusion of helium. These "intermediate" stars cool somewhat and increase their luminosity but never achieve the tip of the red-giant branch and helium core flash. When the ascent of the red-giant branch ends they puff off their outer layers much like a post-asymptotic-giant-branch star and then become a white dwarf. Very low mass stars are fully convective and may continue to fuse hydrogen into helium for up to a trillion years until only a small fraction of the entire star is hydrogen. 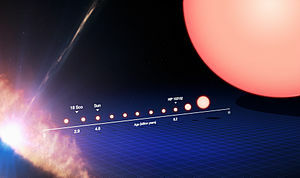 Luminosity and temperature steadily increase during this time, just as for more-massive main-sequence stars, but the length of time involved means that the temperature eventually increases by about 50% and the luminosity by around 10 times. Eventually the level of helium increases to the point where the star ceases to be fully convective and the remaining hydrogen locked in the core is consumed in only a few billion more years. Depending on mass, the temperature and luminosity continue to increase for a time during hydrogen shell burning, the star can become hotter than the Sun and tens of times more luminous than when it formed although still not as luminous as the Sun. After some billions more years, they start to become less luminous and cooler even though hydrogen shell burning continues. These become cool helium white dwarfs. Very-high-mass stars develop into supergiants that follow an evolutionary track that takes them back and forth horizontally over the HR diagram, at the right end constituting red supergiants. These usually end their life as a type II supernova. 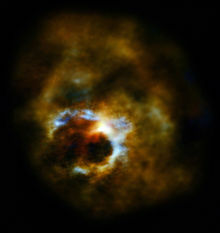 The most massive stars can become Wolf–Rayet stars without becoming giants or supergiants at all. Red giants with known planets: the M-type HD 208527, HD 220074 and, as of February 2014, a few tens of known K-giants including Pollux, Gamma Cephei and Iota Draconis. Although traditionally it has been suggested the evolution of a star into a red giant will render its planetary system, if present, uninhabitable, some research suggests that, during the evolution of a 1 M☉ star along the red-giant branch, it could harbor a habitable zone for several billion years at 2 AU out to around 100 million years at 9 AU out, giving perhaps enough time for life to develop on a suitable world. After the red-giant stage, there would for such a star be a habitable zone between 7 and 22 AU for an additional 109 years. Later studies have refined this scenario, showing how for a 1 M☉ star the habitable zone lasts from 108 years for a planet with an orbit similar to that of Mars to 7015662709600000000♠2.1×108 yr for one that orbits at Saturn's distance to the Sun, the maximum time (7016116763120000000♠3.7×108 yr) corresponding for planets orbiting at the distance of Jupiter. However, for planets orbiting a 0.5 M☉ star in equivalent orbits to those of Jupiter and Saturn they would be in the habitable zone for 7017183034080000000♠5.8×109 yr and 7016662709600000000♠2.1×109 yr respectively; for stars more massive than the Sun, the times are considerably shorter. As of June 2014, 50 giant planets have been discovered around giant stars. However, these giant planets are more massive than the giant planets found around solar-type stars. This could be because giant stars are more massive than the Sun (less massive stars will still be on the main sequence and will not have become giants yet) and more massive stars are expected to have more massive planets. However, the masses of the planets that have been found around giant stars do not correlate with the masses of the stars; therefore, the planets could be growing in mass during the stars' red giant phase. The growth in planet mass could be partly due to accretion from stellar wind, although a much larger effect would be Roche lobe overflow causing mass-transfer from the star to the planet when the giant expands out to the orbital distance of the planet. Many of the well known bright stars are red giants, because they are luminous and moderately common. 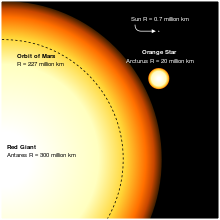 The red giant branch variable star Gamma Crucis is the nearest M class giant star at 88 light years. The K0 red giant branch star Arcturus is 36 light years away. In about 5 to 6 billion years, the Sun will have depleted the hydrogen fuel in its core. It will shrink, with the hydrogen outside the core able to compress enough for hydrogen there to fuse, and will begin to expand into a subgiant. Eventually, the pressure builds up so much that the core will begin to fuse helium, and will expand even more into a red giant. At its largest, its surface (photosphere) will approximately reach the current orbit of Earth. It will then lose its atmosphere completely; its outer layers forming a planetary nebula and the core a white dwarf. The evolution of the Sun into and through the red-giant phase has been extensively modelled, but it remains unclear whether Earth will be engulfed by the Sun or will continue in orbit. The uncertainty arises in part because as the Sun burns hydrogen, it loses mass causing Earth (and all planets) to orbit farther away. There are also significant uncertainties in calculating the orbits of the planets over the next 5–6.5 billion years, so the fate of Earth is not well-understood. At its brightest, the red-giant Sun will be several thousand times more luminous than today but its surface will be at about half the temperature. ^ Boothroyd, A. I.; Sackmann, I. ‐J. (1999). "The CNO Isotopes: Deep Circulation in Red Giants and First and Second Dredge‐up". The Astrophysical Journal. 510: 232–250. arXiv:astro-ph/9512121. Bibcode:1999ApJ...510..232B. doi:10.1086/306546. ^ Suzuki, Takeru K. (2007). "Structured Red Giant Winds with Magnetized Hot Bubbles and the Corona/Cool Wind Dividing Line". The Astrophysical Journal. 659 (2): 1592. arXiv:astro-ph/0608195. Bibcode:2007ApJ...659.1592S. doi:10.1086/512600. ^ Habing, Harm J.; Olofsson, Hans (2003). "Asymptotic giant branch stars". Asymptotic giant branch stars. Bibcode:2003agbs.conf.....H.
^ Schwarzschild, Martin (1975). "On the scale of photospheric convection in red giants and supergiants". Astrophysical Journal. 195: 137–144. Bibcode:1975ApJ...195..137S. doi:10.1086/153313. ^ a b c Laughlin, G.; Bodenheimer, P.; Adams, F. C. (1997). "The End of the Main Sequence". The Astrophysical Journal. 482: 420. Bibcode:1997ApJ...482..420L. doi:10.1086/304125. ^ a b c d Zeilik, Michael A.; Gregory, Stephan A. (1998). Introductory Astronomy & Astrophysics (4th ed.). Saunders College Publishing. pp. 321–322. ISBN 0-03-006228-4. ^ a b c Fagotto, F.; Bressan, A.; Bertelli, G.; Chiosi, C. (1994). "Evolutionary sequences of stellar models with new radiative opacities. IV. Z=0.004 and Z=0.008". Astronomy and Astrophysics Supplement Series. 105. Bibcode:1994A&AS..105...29F. ^ Alves, David R.; Sarajedini, Ata (1999). "The Age-dependent Luminosities of the Red Giant Branch Bump, Asymptotic Giant Branch Bump, and Horizontal Branch Red Clump". The Astrophysical Journal. 511: 225. arXiv:astro-ph/9808253. Bibcode:1999ApJ...511..225A. doi:10.1086/306655. ^ Reiners, A.; Basri, G. (2009). "On the magnetic topology of partially and fully convective stars". Astronomy and Astrophysics. 496 (3): 787. arXiv:0901.1659. Bibcode:2009A&A...496..787R. doi:10.1051/0004-6361:200811450. ^ Brainerd, Jerome James (16 February 2005). "Main-Sequence Stars". Stars. The Astrophysics Spectator. Retrieved 29 December 2006. ^ Richmond, Michael. "Late stages of evolution for low-mass stars". Retrieved 29 December 2006. ^ Crowther, P. A. (2007). "Physical Properties of Wolf-Rayet Stars". Annual Review of Astronomy and Astrophysics. 45 (1): 177–219. arXiv:astro-ph/0610356. Bibcode:2007ARA&A..45..177C. doi:10.1146/annurev.astro.45.051806.110615. ^ Georges Meynet; Cyril Georgy; Raphael Hirschi; Andre Maeder; et al. (12–16 July 2010). G. Rauw; M. De Becker; Y. Naz\'e; J.-M. Vreux; et al. (eds.). "Red Supergiants, Luminous Blue Variables and Wolf-Rayet stars: The single massive star perspective". Societe Royale des Sciences de Liege, Bulletin (Proceedings of the th Liege Astrophysical Colloquium). v1. Li'ege. 80 (39): 266–278. arXiv:1101.5873. Bibcode:2011BSRSL..80..266M. ^ Lopez, Bruno; Schneider, Jean; Danchi, William C. (2005). "Can Life Develop in the Expanded Habitable Zones around Red Giant Stars?". The Astrophysical Journal. 627 (2): 974–985. arXiv:astro-ph/0503520. Bibcode:2005ApJ...627..974L. doi:10.1086/430416. ^ Ramirez, Ramses M.; Kaltenegger, Lisa (2016). "Habitable Zones of Post-Main Sequence Stars". The Astrophysical Journal. 823 (1): 6. arXiv:1605.04924. Bibcode:2016ApJ...823....6R. doi:10.3847/0004-637X/823/1/6. ^ Jones, M. I.; Jenkins, J. S.; Bluhm, P.; Rojo, P.; Melo, C. H. F. (2014). "The properties of planets around giant stars". Astronomy & Astrophysics. 566: A113. arXiv:1406.0884. Bibcode:2014A&A...566A.113J. doi:10.1051/0004-6361/201323345. ^ Ireland, M. J.; et al. (May 2004). "Multiwavelength diameters of nearby Miras and semiregular variables". Monthly Notices of the Royal Astronomical Society. 350 (1): 365–374. arXiv:astro-ph/0402326. Bibcode:2004MNRAS.350..365I. doi:10.1111/j.1365-2966.2004.07651.x. ^ Abia, C.; Palmerini, S.; Busso, M.; Cristallo, S. (2012). "Carbon and oxygen isotopic ratios in Arcturus and Aldebaran. Constraining the parameters for non-convective mixing on the red giant branch". Astronomy & Astrophysics. 548: A55. arXiv:1210.1160. Bibcode:2012A&A...548A..55A. doi:10.1051/0004-6361/201220148. ^ Alves, David R. (2000). "K-Band Calibration of the Red Clump Luminosity". The Astrophysical Journal. 539 (2): 732. arXiv:astro-ph/0003329. Bibcode:2000ApJ...539..732A. doi:10.1086/309278. این صفحه آخرین‌بار در ‏۱۵ آوریل ۲۰۱۹ ساعت ‏۱۹:۰۵ ویرایش شده‌است.